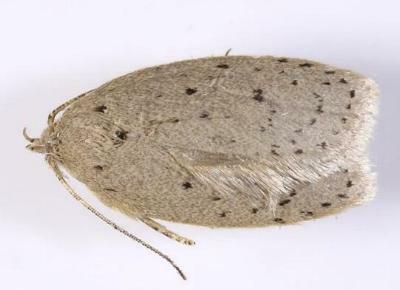 The moths of this species have off-white forewings, each with some dark brown spots, including an arc around the margin. The hindwings are off-white shading to brown at the wingtips. The wingspan is about 2 cms. CSIRO Publishing, Melbourne 1994, p. 134-135, 173.